How does language map the environment and how does the environment map language? 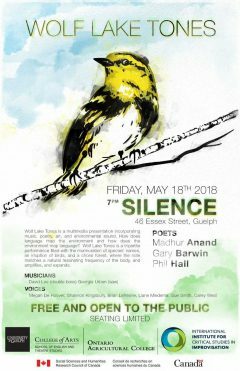 On May 18, 2018 at Silence Guelph, poets Madhur Anand, Gary Barwin, and Phil Hall were joined by musicians David Lee (double bass), and Georgia Urban (saw), as well as singers Megan De Roover, Shannon Kingsbury, Brian Lefresne, Liane Miedema, Sue Smith, and Carey West (all as voices of birds), for a night of improvisational exploration of the interconnection between the human and the non-human, between language and the environment. The artists involved in Wolf Lake Tones responded to the scientific article “The scientific value of the largest remaining old-growth red pine forests in North America”, resulting in a multimedia presentation incorporating music, poetry, art, and environmental sound.